Missing a flight isn’t always so bad. | Where's Zoe now? Missing a flight isn’t always so bad. I wish I could live by that logic, but I’m the sort of person who starts getting tense as soon as she realizes she’s only going to get to the airport 2 hours ahead of her flight, rather than 2.5. I don’t even know why — I mean, it’s nice to be able to buy a magazine and read it while sipping a coffee in a departure lounge, but it’s not that nice. The coffee, magazine and view would be better outside the airport, after all. And the worst of it is, my obsessive earliness for flights hasn’t stopped me from missing planes, so my approach doesn’t even work. And when I have missed a flight, everything has been somewhere between “fine” and “unexpected fun” on a scale of disaster-to-fantastic, so my approach doesn’t even need to work. Here are some True Stories of Travel Disasters. Maybe they will inspire you to waste less of your life in airports. I was travelling for work, with a colleague. My alarm was set for 6.30am, giving me just enough time to get out of bed and get to Turin airport for our flight to Paris, where we’d connect to a flight to Seoul. At 6, my phone rings. Some days later, we discovered that there had been a notification of the cancellation, it’s just that it had gone to the administration office at work and not us. But that wasn’t much help to us then. We needed to get to Seoul, and at this point we weren’t sure we even had tickets. My colleague was skeptical about our chances. “They’ll tell us we’re no-shows on whatever flight they rebooked us on, and that we’ve forfeited our itinerary.” We decide to go to the airport and plead our case. We exchange this-is-going-better-than-we-thought-it-would glances, and push our luck. Our first flight goes smoothly. On our flight from Rome, we talk through the connection in Paris, like it’s a military exercise. We have to collect our bags and get to the transfer desk to pick up our boarding passes and we’ve got about half an hour to do it in, which isn’t a lot in a big airport like Charles de Gaulle. We land. We scramble off the plane as fast as possible. Where’s the baggage collection? Belt 6. Aaaah why is this baggage taking so long? Here’s some suitcases. None of them ours. We check the time. New strategy. I’ll go and get the boarding passes, see if I can talk them into giving me both of them, and we’ll meet at the security line. I start jogging to the check-in desk. The signage makes no sense. Is it upstairs or on this level? Wait, did I go past the turn off for it? Who even designed this airport? Great. Now I’m lost. My phone doesn’t want to connect to a network so I’m on my own. The hallways have large windows facing the afternoon sun, and on this summer day, it’s boiling. Travelling for work, what kind of idiot agrees to do that anyway? Finally, out of breath, I find the check-in desk. (It was upstairs.) “There you are!” It took me so long to find this check-in area my colleague is already here with our suitcases. We’ve missed the check-in deadline by at least 15 minutes, but we line up anyway, see if we can make puppy-dog-eyes and get some some boarding passes. The check-in agent is not impressed, but in our sweaty breathless state we give a strong impression that it would be better to give us what we want than to try and tell us no. We’re not going to argue with that. We jog again. At security, we ditch all the toiletries we’d packed for our checked bags that now have to be carry-on compliant. We make it on board, the final passengers. I don’t usually drink on planes, but when drinks service comes around, I take a beer. I worked for that one. The trouble starts in Munich. I’m already annoyed, after being grilled by the terrifying middle-aged Bavarian women who won’t let me through to the gate for my flight to the US until I’ve convinced them that I am legitimately both Australian and British and that furthermore I live in neither of those places. At the gate, the only option for food or drinks is a vending machine that only takes coins, and I only have notes. And then there’s an announcement. Due to late arrival of the incoming flight, our flight will be delayed. “Typical United,” mutters a man sitting near me. Two hours later, we’re finally off. I’m running through my schedule in my head. At Washington, I’m supposed to change planes for Denver, and at the moment I’m booked on the last one for the night. With a 2 hour delay on a 2.5 hour connection, will I make it? I hope there’s a decent airport hotel at Washington. The next day, the surreality continues, as we take off on a flight nominally bound for Washington, but, as the captain announces, “the whole east coast of the US is covered in ice and snow, so we’ll see where we can land when we get there.” I do eventually make it to Denver. I’m about to burst into tears in the middle of Singapore Changi airport. The flight from London had been delayed and now I’ve missed my connection to Perth, where I’m planning to spend 3 weeks with family and friends in between leaving Glasgow and moving to Turin. It’s 1am, and the next available flight isn’t until evening the next day. I just want to get home. The couple behind me in line are concerned, “Is everything ok?” Which is very kind and puts me even closer to tears. This is all a bit embarassing, especially because my emotional response makes them seem to think I’m about to miss a family funeral or something. Nope, just tired and fed up. I slouch over to join the group of delayed passengers who need accommodation. The airline-provided hotel is in the city centre. I have a whole day to sightsee, and I intend to dislike the place. I don’t want to be here, I want to be in Perth. If the flight from London hadn’t been delayed, I would almost be in Perth by now. It’s the food that wins me over. The hotel is used to groups from the airlines and puts on dinner for us, at 2am. Even in a bland hotel, the food is tasty, with dishes with Chinese and Malay and Indian influences. Well at least I’ll have a few meals like this, I think. The next day, at breakfast I talk to some german tourists who have been delayed on their way to Darwin and Kakadu. They suggest I go sightseeing in Singapore with them. My luggage is somewhere in the airport, so I’m still dressed for the flight, in my jeans and knee-high boots and a long-sleeved tshirt. Good clothes for Singaporean airconditioning, but terrible for walking outside in the sun. I decide to go shopping for more suitable clothes instead. The mix of colonial buildings and modern skyscrapers and tropical greenery and yes, several pit stops for Singaporean food, makes for a surprisingly pleasant day of walking around. Yes, the feeling of everything’s-so-clean gets a bit creepy if you’re a Westerner like me, but it’s also quite peaceful to spend a day in a place that’s well-maintained. At one stop for iced coffee I flick through a magazine aimed at expats and even feel a slight pang about not staying long enough to go to some of the arts events that were happening. 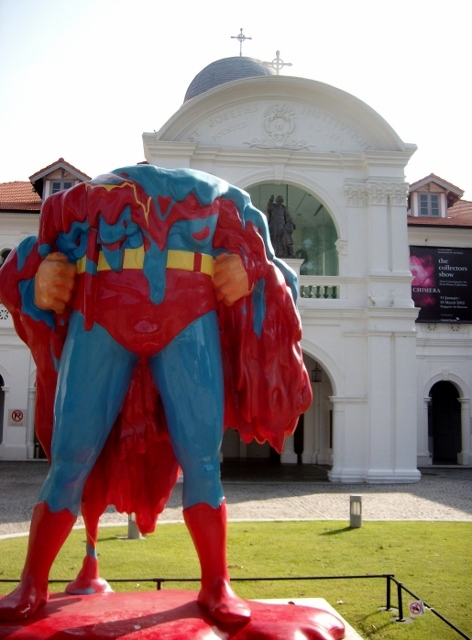 This is how I felt walking in Singapore heat wearing tall boots. I’d never considered making a stopover in Singapore even though I’ve passed through its airport so many times. But even with it’s bad start, my enforced stopover really did win me over and these days when I look at long-haul flights, I always keep a long connection in Singapore open as a possibility. 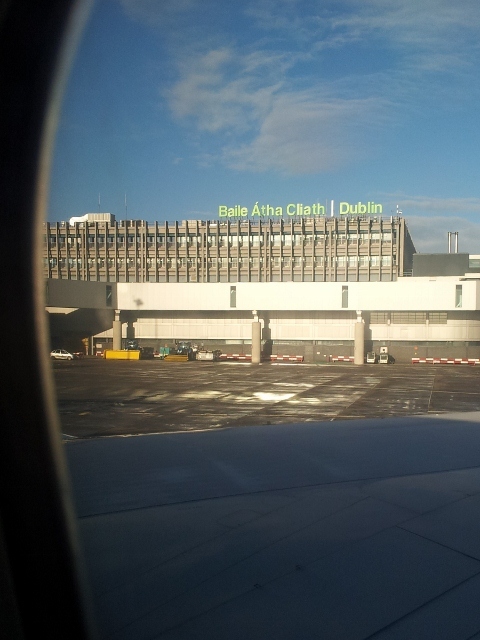 This entry was posted in Ireland, Korea, Living in Turin, Singapore and tagged airports, Dublin, flying, layover, Singapore, stopover, travel on June 21, 2015 by Where's Zoe Now?. Yes! I lived in Singapore for a year and a half and even though it took some time to win me over, now I always try to visit when I can, even if it’s only for a couple days! The food especially is SO WORTH IT. I’ve never actually missed a flight, but I’ve had my connection cancelled a few times. Charles De Gaulles is the worst airport. Who invented that place?